Gate( Graduate Aptitude Test for Engineering) entrance test was successfully conducted on February 4, 5, 11 and 12, 2017. 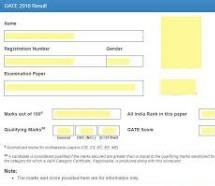 Gate result will be declared on march 27th 2017.The candidates who are appeared the GATE examination are eagerly waiting for result.The GATE results will be declared on official website candidates can log in through GOAPs to check their GATE 2017 result and if they qualified they can download score card.The GATE result and score cared will be declared on same day.GATE final key declared on official website www.gate.iitr.ernet.in on March 16th,2017. GATE result will be valid for 3 years from the announce date.GATE score cards declares only if the candidates get qualified marks or equal to qualified marks.GATE score card will be used for recruitment in PSUs like ONGC, BHEL, GAIL, SAIL etc. and for pursuing M.E., M.Tech, and Direct Ph.D. from IITs, NITs and CFITs.If the candidate get the qualified marks the sore card will be issued ,candidates can download score card without pay before March 27 to May 26, 2017 after May 26 to December 31, 2017 for score card candidate needs to pay 500. Go to official website www.gate.iitr.ernet.in or click on given direct link. Click on GATE result tab. Enter registration number,roll number,date of birth. GATE 2017 result will be shown on your screen. check your qualified or not. If you qualified then only you will be get score card. The marks of candidates in GATE 2017 will be calculated out of 100 while the GATE Score will be displayed out of 1000.After the evaluation of the answers, the raw marks obtained by a candidate will be converted to a normalized GATE Score. The GATE score will be computed using the formula given below.Calculation of Normalized Marks for CE, CS, EC, EE and ME papers (multi-session papers). In GATE 2017, examination for some papers may be conducted in multi-sessions. Hence, for these papers, a suitable normalization is applied to take into account any variation in the difficulty levels of the question papers across different sessions. The normalization is done based on the fundamental assumption that “in all multi-session GATE papers, the distribution of abilities of candidates is the same across all the sessions”.This assumption is justified since the number of candidates appearing in multi-session papers in GATE 2017 is large and the procedure of allocation of session to candidates is random. Further it is also ensured that for the same multi-session paper, the number of candidates allotted in each session is of the same order of magnitude.After evaluation of the answers, normalized marks based on the preset formula will be calculated corresponding to the raw marks obtained by a candidate and the GATE 2017 Score will be calculated based on the normalized marks. GATE Score card can be download from GATE Online Application Process System(GOAPS). Click on link we have given to open GOAPS. Enter the details like Enrollment ID or Email address. Enter the GOAPS password and captcha. GATE 2017 score card will be shown on screen. Save and download details for further usage.